Looking for boat storage on Lake Lanier? Port Royale Marina is the BEST location on Lake Lanier to store your boat. Only minutes from GA 985 and 400 North, we are located off Browns Bridge road. Our location is described as the gateway to the North and the calmest, most scenic part of Lake Lanier. Port Royale Marina is truly a full-service marina, offering a comprehensive list of amenities and services. Not only is our marina a great place to call your boating home, but it is also a great place to relax and enjoy what lake life has to offer. 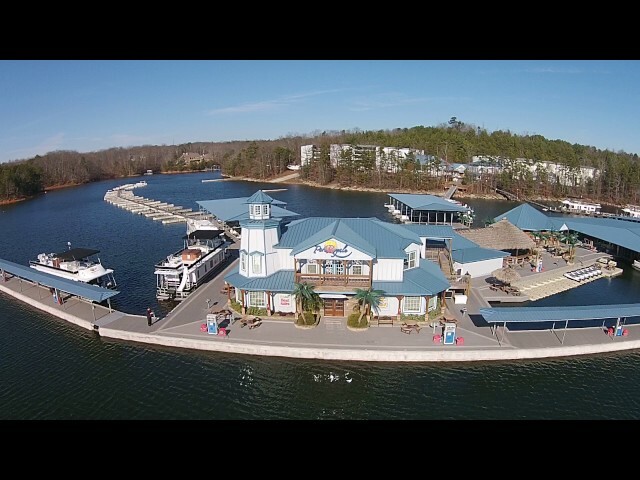 Open seven days a week year-round, Port Royale Marina can accommodate any size boat suitable for Lake Lanier. 517 Dry Stack Storage spaces located within three Dry Stack buildings. With your comfort in mind, we have covered 75% of our wet slips; including our 18’ x 80’ Super-Docks, featuring private lake view patios. Each slip is equipped with power and water. Nestled in a deep water cove, our slips are conveniently located directly off the main waterway. You can be out on the lake, enjoying your day in no time at all! The Port is also home to Lake Lanier’s largest marine repair service. We are a full-service factory authorized Service Center with seven highly-trained, certified technicians, including two Master Technicians. No request is too large or too small for our technicians. Our Service Center has the highest possible certifications and CSI ratings from every manufacturer, including Mercury Marine, Yamaha, Volvo, Tracker Marine, Bayliner, and Brunswick Corp. Our fast, reliable service is backed by our guarantee to stand behind every repair! At Port Royale, we have something for everyone. If you do not own a boat, you can rent one from Paradise Rental Boats. Our rental fleet has a wide selection of boats from Waverunners to Houseboats. Call today to reserve your day of fun in the sun! While you are out on the lake, stop in at Pelican Pete’s Bar and Grill! Pelican Pete’s is open Monday through Thursday and Sunday from 11:00 AM to 10:00 PM; Friday and Saturday from 11:00 AM – 11:00 PM during the summer season. On the weekends, you can dine on the water while listening to the musical styling’s of some of the Lake Lanier’s finest musicians! Our restaurant not only provides entertainment for adults, but kids will also enjoy the Water Play Place. With its amazing lake view and relaxing atmosphere, Pelican Pete’s is the place to be for Summer Fun! Port Royale is under a five year, multi-million dollar transformation to create the largest, highest quality marina in Georgia. We invite you to come and visit us soon. Once you have seen what we have to offer, you will want to make Port Royale Marina your home on Lake Lanier! Port Royale offers a wide variety of amenities to our members and friends. Our amenities include: Wireless Internet on our docks; Two 24-hour Pump-out Stations; Mobile Pump-out at your slip; Wide Easily Accessible Walkways; Well-lighted Parking; Heated Bathhouse; Two Private Launching Ramps, Great food, Great drinks and Great fun at Pelican Pete’s Bar and Grill; Ship’s Store/Service Center; In-house Sales Associates from Park Marine Boating Centers –Georgia’s premier pleasure boat dealership, On-site Security with gate. In addition, Port Royale is home to Lake Lanier’s only floating Gas Island and Ship’s Store with 18 Self-Service Pumps and 2 Full Service Pumps for your convenience. Located adjacent to our Dry Stack Courtesy Dock, the Lighthouse at the Port has everything you need for a day on the lake, including ice drinks, snacks, water toys, sunglasses, sunscreen, souvenirs, and boating supplies. If you need it, we have it!